Tif1α (Trim24) is a transcriptional coactivator that interacts with numerous nuclear receptors and coactivators and modulates the transcription of target genes (1, 2). Interacts with chromatin depending on histone H3 modifications, having the highest affinity for histone H3 that is both unmodified at 'Lys-4' (H3K4me0) and acetylated at 'Lys-23' (H3K23ac). Has E3 protein-ubiquitin ligase activity. Promotes ubiquitination and proteasomal degradation of p53/TP53 (3). Plays a role in the regulation of cell proliferation and apoptosis, at least in part via its effects on p53/TP53 levels. Up-regulates ligand-dependent transcription activation by AR, GCR/NR3C1, thyroid hormone receptor (TR) and ESR1. Modulates transcription activation by retinoic acid (RA) receptors, including RARA. Plays a role in regulating retinoic acid-dependent proliferation of hepatocytes. Defects in TRIM24 are a cause of thyroid papillary carcinoma (4). Recombinant human N-terminal FLAG tagged Tif1α was produced in SF9 insect cells, purified using FPLC and formulated in a storage buffer containing 20mM Tris-Cl pH 7.6, 1mM EDTA, 0.15 M NaCl, 10% glycerol, 0.5mM PMSF and 1mM DTT. Protein concentration was determined by spectrometry. >95% purity by SDS-PAGE. 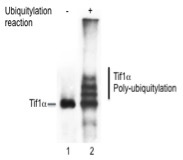 SDS-PAGE gel of recombinant auto-ubiquitylated Tif1α (Lane 2). Lane 1, recombinant FLAG Tagged Tif1α. Tif1α modification with ubiquitin (Ub) was reconstituted in vitro in the presence of recombinant E1, E2, Ub and ATP. Tif1α auto-ubquitylation results in a mobility shift of 8kDa. The efficiency of in vitro auto-ubiquitylation is evaluated by 8% Tris Glycine SDS-PAGE.